Anyone who knows me, knows I'm usually up for almost any sort of adventure. 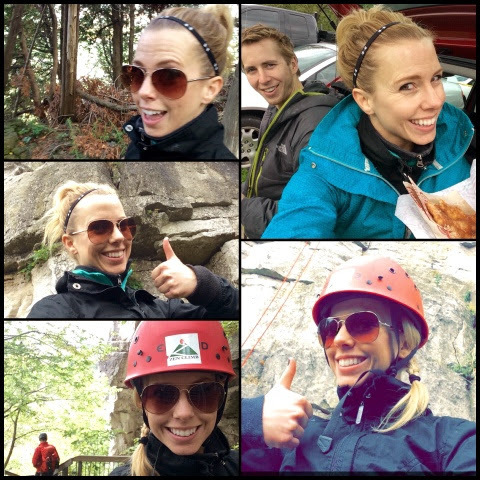 Naturally, when the opportunity to try rock climbing came up, I didn't even bat an eyelash . 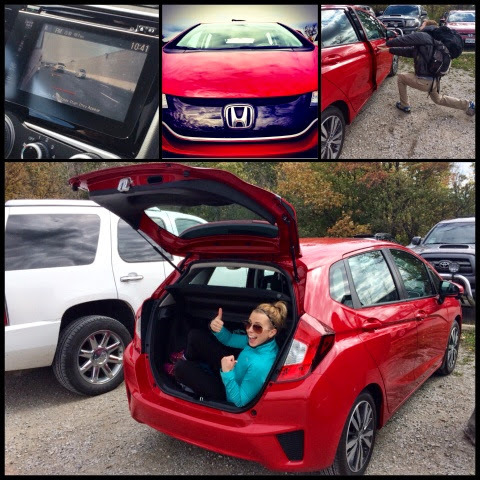 I met up with Chase, an experienced rock climber (and Honda Fit lifestyle ambassador) on a crisp fall Sunday morning and we set off in the all new 2015 Honda Fit! For such a little car I was surprised by the amount of pep and power it had on the highway! I was even more impressed with the super cool technology in this sweet little ride. It has blind spot cameras so when you changed lanes it showed a display of what was beside you. The dash had a very modern look with a fully integrated touch screen for all your entertainment needs and it even had a handy USB port so I could educate Chase on the finer points of quality country music! With lots of room for our climbing gear, and some sweet tunes, we were ready for the adventure ahead! First stop was a great hike through the hills of Mount Nemo. Mount Nemo is part of Halton Parks, and I'll tell you, this hike proved to have some of the best views I've seen. It was a wonderfully clear day and I swear I could see my house from up there! It amazes me how very lucky I am to live in such a beautiful province. 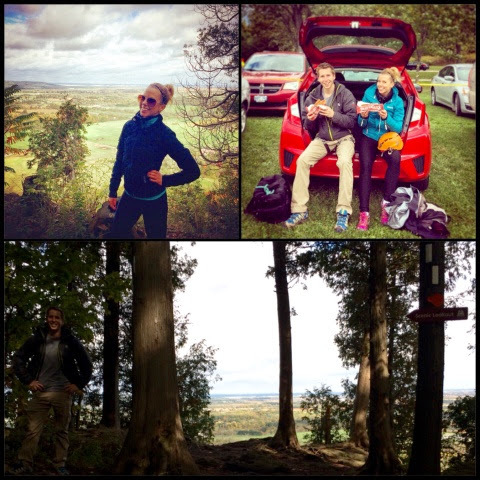 After our hike at Mount Nemo, we jumped back in the Fit and were on our way to Rattlesnake Point. Yes, the name is terrifying and makes one think of the dark area you can see from Pride Rock in the Lion King. "You must never go there Simba," yeah, well Moufasa, I went there. I would say this place is not quite as scary as the name implies. 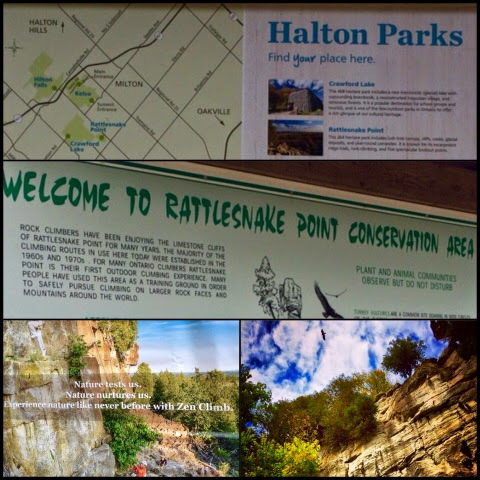 After a VERY twisty, turny (don't underline that in red spell check, I know that's not a word, but I'm using it anyway) and again twisty drive up, we arrived at Rattlesnake Point! It was at this point the real fun began! We met up with our climbing guides, Dan and Karen from Zen Climb. They were very patient with me and helped me get my gear situated. My partner in climb, Karen, was very patient and extremely encouraging. There are a couple fantastic videos you can check out on my instagram @hmac158 The long and short of this is that I discovered 2 things on this beautiful crisp fall morning: 1 - rock climbing is hard! 2 - I have a fear of heights. Thanks to Karen I was able to work through some of that fear - at one point when I was really, really high up, (okay, it was only about 6 ft up a large rock face) I asked her "Has anyone got to this point and just said, "Ya know what? I'm good with this, I'm done.'" She simply responded, "Nobody." "Okay cool... I'm just gonna keep going." I made it to a ledge about 40 ft up and only had one other minor freak out when it was time to head back down (again video is on my instagram @hmac158). After completing my great Ontario rock climb, I decided to call it a day. Chase continued to climb a bit longer, as it appears he may had done it once or twice before. Despite my minor little freak outs, I had an incredible time and am so happy I had the opportunity to take part in this adventure. I love this beautiful province I call home and it was amazing to have this adventure to see it in a completely new and wonderful way! I definitely need to give a shout out and a great big THANK YOU to the people at Zen Climb! They were fantastic and they never let me give up. 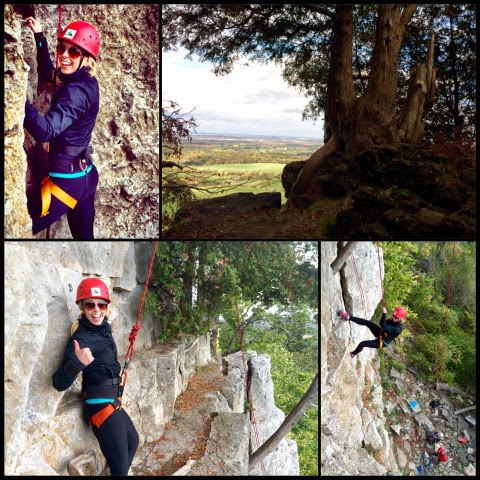 If you too are up for any adventure, I highly recommend braving the rock faces of Rattlesnake Point. Now what kind of post would this be of mine without a few selfies? After all that climbing and hiking we definitely built up quite the appetite, lucky for us a Beavertail food truck was in the park that day! Mmmm Beavertails! Thanks for being a great guide that day Chase, and thanks for putting up with all my picture taking! Special thanks for Honda Canada for sending Chase and his fancy Honda Fit and organizing the day! Camping with an Infant: Let's Go RVing!